Pull your own weight. We come to cook, not just to eat. Last night we tried something different. 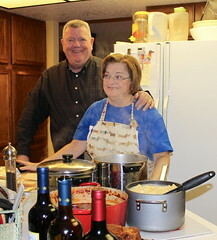 At earlier meetings, members prepared their assigned parts of the meal at home. Once we gathered at the host’s house we sat right down to eat. We were all here for Thanksgiving: Crouton & Ditalini, our son Baguette, daughter-in-law Truffle, and grandson Pesce, along with our daughter Escargot and her boyfriend. Underfoot, of course, were Mortadella & Ubriaco, along with Baguette’s dog. Our poor old cat spent the day hiding in a closet. It’s time to address comfort food, and what could be more comforting than meatloaf? Here’s an easy beef enchilada recipe Ditalini picked up from her friend Cherie, with slight modifications to make it her own. What to do with that leftover Easter ham? Ummm . . . scalloped potatoes!